On The Wooled Side ! Being in ones space alone, brings new beginnings by finishing what has already been started. This Magdalena Style Folk art rug was started last Feb and now finished and in it’s new home in the kitchen.Only the artist knows exactly what each figure stands for and how it was executed it on linen. A little help from Magdalena to get me thinking! I love the folk art style as it goes against the grain of all that I have done because it gives me a new freedom to create “just because” and not because I think it all needs to be perfect. Out the door with perfectionism when it comes to what I am aiming at in life and I am on a journey of discovery. One of creativity to see what is within my authentic self and find myself there. These past few months have been difficult but so rewarding as time has given me the opportunity to see what is important and that is the JOURNEY! “A Road Back To Yourself’ by Joan Anderson has encouraged me to take the break I need to regain my emotional balance not only in my personal world but my creative world. Life is to be enjoyed and now that the children have been gone for many years and have happy lives of their own, it is time to be for myself. I can communicate that in my hooking if I let go of all the expectations that life has had on me. What am I waiting for? Someone else’ demands or rigid ones I impose on myself? In Joan’s words ” I have been rushing in a straight line, pushing forward in a straight line, pushing onward and upward to goals set most often by other people, against whom I’ve been measuring myself”. The hooking world is one of the ways I can find what and who I am by this means of communicating. We are never there but I promise to learn from all heart ache, find the good, give thanks for the journey and embark on a new day! There is much activity as I begin the packing for my trip south to vend and teach at Searsport Hook In In Punta Gorda at the Charlotte Convention Center. 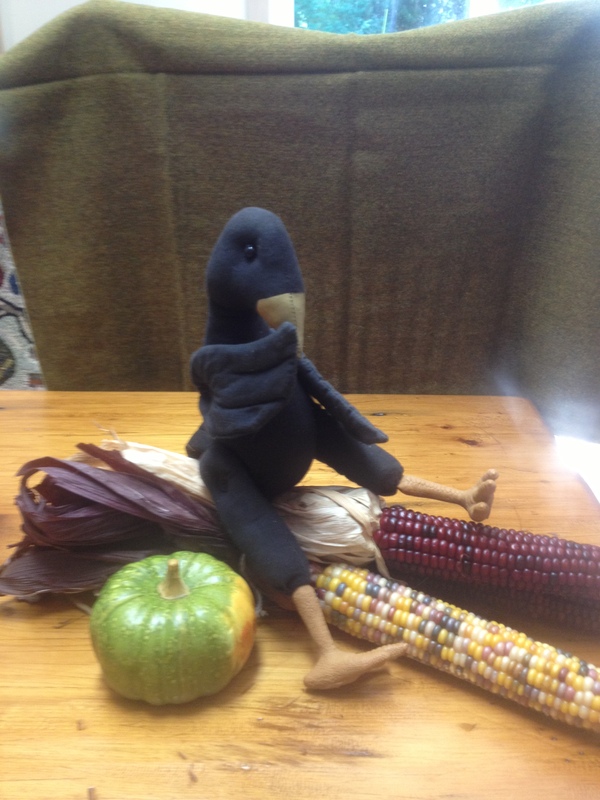 New products will be available in my booth to embellish our rug hooking, from dyed ribbon, to DREADS and more. 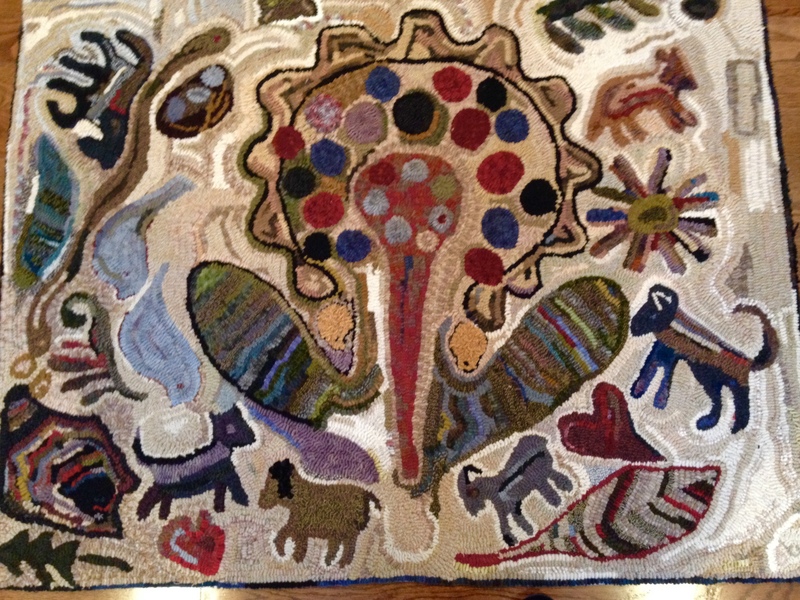 Thursday Feb 26 at 10:00 I will doing a demo for embellishing your rugs. I will be vending at the Naples Quilt Guild Quilt Show in Naples on March 6 and 7. Try adding wool to your quilting… Do it just because you want to try it! Off to the closet for summer clothes and a suit case !!! Well I did have a nice creative night in the studio. I went to a basket of already cut noodles and found what inspired me for a tea cozy. I find I enjoy the spontainious times more fulfilling. With needle and hook and leftover linen and a variety of colors I have a small tea cozy that I will enjoy for a long time. I decided to make a 1 1/2 cup tea pot cozy instead of a large pot size. I only drink about the small one at a time any way. I used cording for the rounded edge which gives it a nice finished look. To ensure no backing is showing between the cording and hooking, from wrong side, press seam allowance to the middle of hooking. It snugs right up and fits nicely. Now comes the job I really do not like doing but will not procrastinate in making the soft lining to hold the heat in. I sewed a double folded strip of wool in a loop to attach on top for removing.If you would like to do one, look in your craft box or drawer of little items, add a round curtain ring or bobble from a piece for broken jewelry. well so far I have kept my promise to myself and post often. Now that I had my college student come give me a few lessons on posting I need to practice often and get it in the “brain”. I really am a right brained person and need to see what and how things need to be done….sooo, two so far! hope everyone uses this “in time” to create and finish old projects and create new. I finished an over the door mat last night by finishing with crochet edge. It is a new pattern of mine called Enough For Two. It is two little foxes facing each other with a cherrie tree between them. This was inspired by 2 little guys who ran up and don the side of my street all summer long with no fear. The cherry orchards are just up the hill so it came to fruition! Getting ready for my studio open house on Saturday from 1-3 so out there for the rest of the day to hang and arrange more mats and rugs. I love to organize and make everything look new so out come the slidders to move furniture , the vacuum and Murphys! Will sit and enjoy it tonight by the little stove with a nice glass of wine and soft music! Enjoy your cabin fever time! A new needle group will be forming at the studio soon! “NEEDLE AND HOOK” is a night of discovering many new ways to incorporate all the needle arts you have used, enjoy and learning new ones. 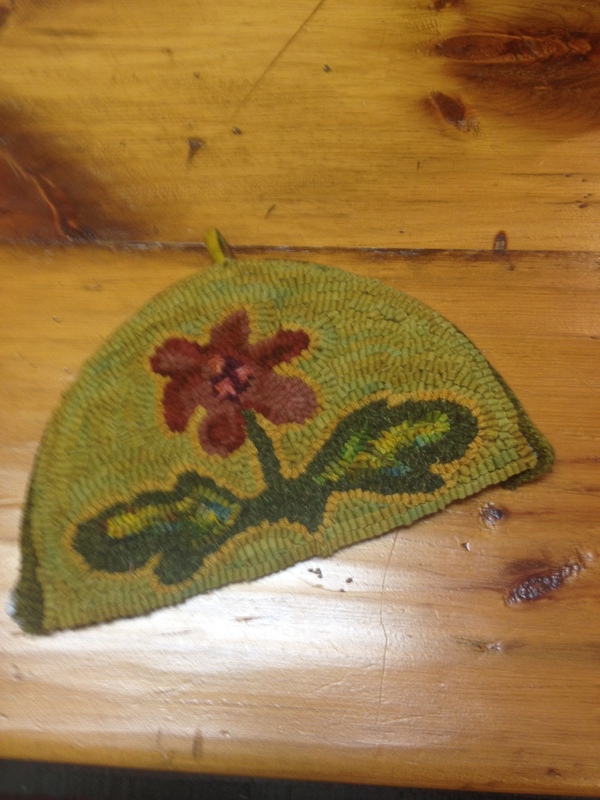 Rug hooking, embellishing, quilting, applique, needle felting, embroidery all in one! Small projects will be taught to inspire you in your larger projects. Join us on Sat Jan 17 from 1:00 – 3:00 to check out the studio and with bins full of beautiful wool, wool yarns and threads use in our projects. Getting together with others is a hands on learning experience. Someone always has a thing to add to the group and get your mind thinking in new ways of creating. Resolutions? Keep Moving forward, take time for myself,post often, try new things…….. The ground is covered in it’s winter blanket and 5 degrees today. 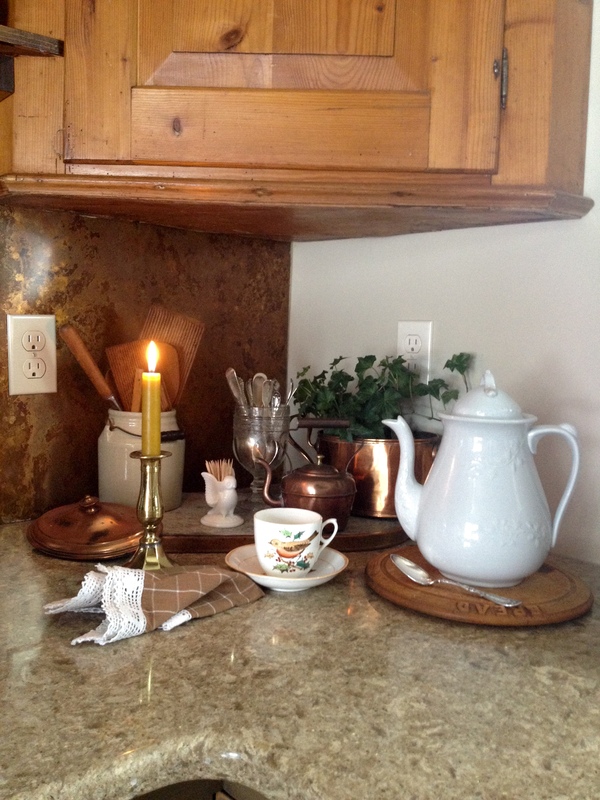 Taking out a favorite antique tea cup and saucer and brewing tea in an ol English tea pot. Tonight I will go out to the studio and play by designing a wool tea cozy. A pot of soup is on the stove in my favorite copper kettle. I will sit a small table in front of the kitchen window and watch the snow falling softly. A mix of antique Flo Blue and Ironstone with unmatched antique silver ware and cloth napkin with cotton lace will grace the table for my special time. A simple meal served with my favorite collections and a view make for time to let my mind go to a dreamy place to create before heading to the studio. Why not live your dream….enjoy and be in the moment! 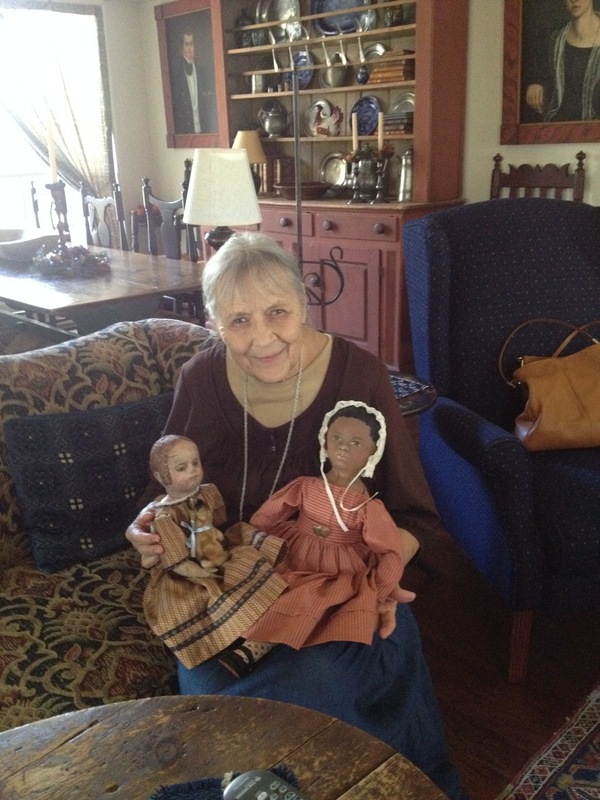 A trip to Texas to visit children and grandchildren I took a day to meet and visit Edyth Oneil in Fredricksburg Texas. What a delight! It was one of my dreams and all it took was a simple email and 3 hrs travel time!She has always been an inspiration and much in common as Antique dealers. collectors of Antique China head Dolls, as well as and not least, designed and Hooks rugs! I purchased one of Edyth’s large dolls ready to be dressed! She did have a name from Edyth but it was only giving an proper to name her Edyth! Another evening this winter in the studio, I will pull out baskets of antique fabrics, buttons and trims to design and make a new dress, knit a shawl for her. Of course she will need a hand hooked small rug to sit in front of her Windsor chair. So much fun! 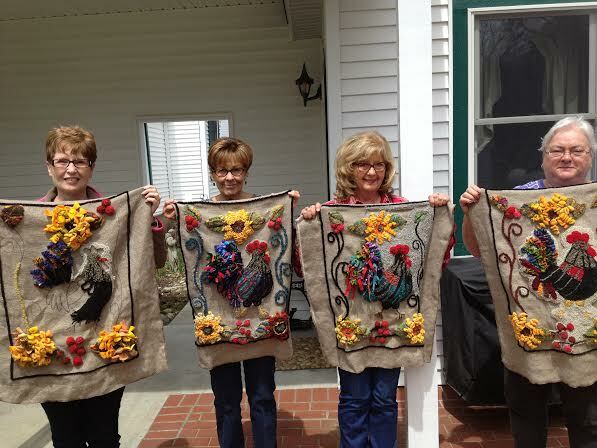 The “Thursday Hooking Girls” will begin their new 6 weeks class and doing a Hit and Miss rug to use some of their scraps. Next week will be an open house for the Fiddlehead Finery Studio for quilters, hookers, and needleworkers who have not been here. The Thursday Girls will be showing some of their finished rugs as well. Go to the calendar and see the schedule for events. Enjoy your Cabin Fever time…..you will find you don’t have enough cabin time! I know I won’t!!!! p.s. If you don’t hear from me often, please help me keep my resolution and email me for new postings! Check out Alistrebeldesigns.com from Kindred Spirit! Ali and DeEtta are getting new wools dyed, wool projects ready for the big day. 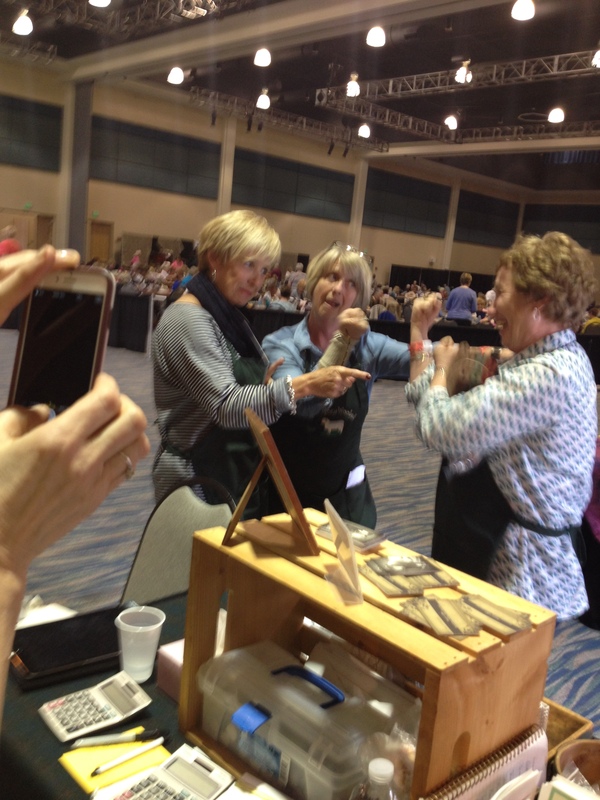 Come ready to be inspired beyond rug hooking with these two. A day of inspiration for all the needle gals out there. 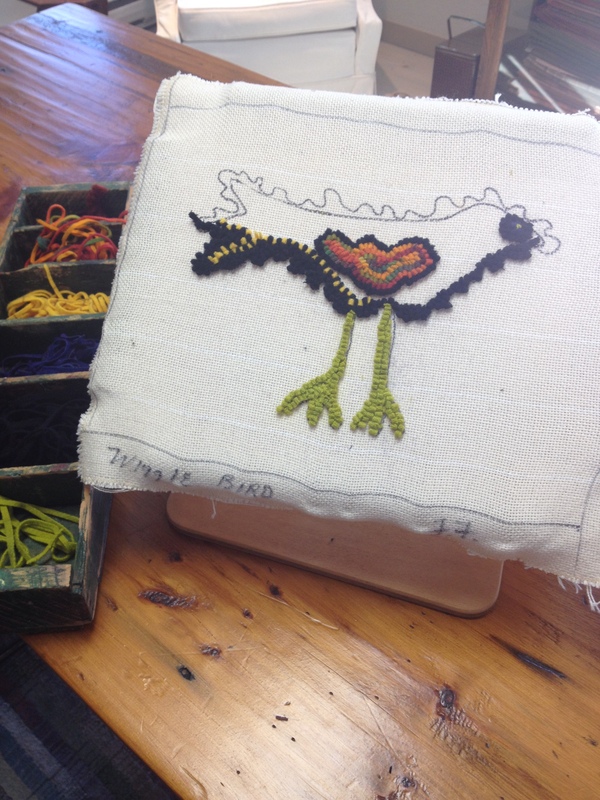 Fall and Winter hooking classes at the studio produced some wonderful projects! The subject was a Rooster by Primco Designs. 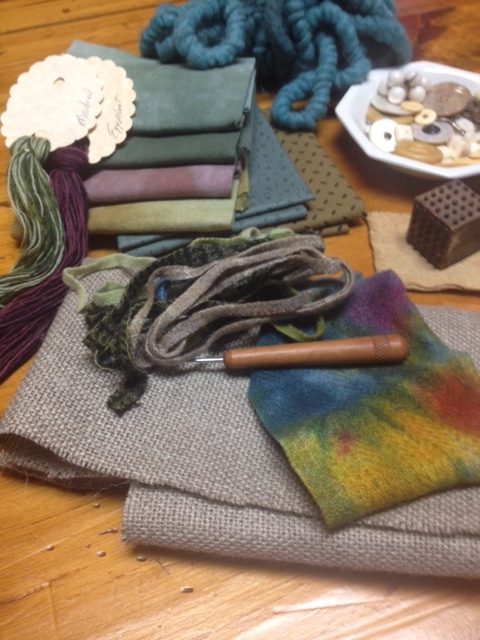 The use of color and texture with many varied fibers was as individual as each person that participated. Multi-colored yarns, wide cut strips that were done in proddy method. felted sweaters, silk blouses and other fibers that gave texture and color in discovering the unlimited sources of fibers for hooking. Hands up to Kathy, Dana, Carol and Colleen! Looking forward to our Fall sessions in more discovery with “Dreads” and more! Keep posted for more great results from these talented hookers. Just a few reminders of upcoming events from Fiddlehead Finery. Ideas and samples of hooking with more than wool strips to give texture and color to your hooking pieces. Step out of the box with us! REFUNDS AFTER SEPT 13 WILL NOT BE ABLE TO BE GIVEN. We have expanded to a two day event. You won’t want to miss out on Friday’s workshop. Judy our Chef will be providing snacks and delicious fall luncheon. vendors will be available for all of your hooking needs as well as gifts for those on your gift lists. During the workshop there will be mini workshops available. classes will be small so sign up early. pre registration and check included required. I will be going to Punta Gorda again this winter to vend with beautiful hand dyed wools, Fiddlehead Finery patterns and also teaching a workshop once again with Chris and Julie from Searsport Rug Hooking. It has been a wonderful experience working with many talented people who let me take them beyond the normal thrumming of rug hooking. This year I will be teaching a class with different forms of hooking. Needlepoint with tarditional all in one project! Feb 25 and 26 9-4 at the the Convention Center on the Peace River in Punta Gorda. Visit Searsportrughooking.com for more info in AUGUST. Keep well, enjoy your summer fun but mark your dates and register early!